One of my most valued apps on my BlackBerry has received an update today. 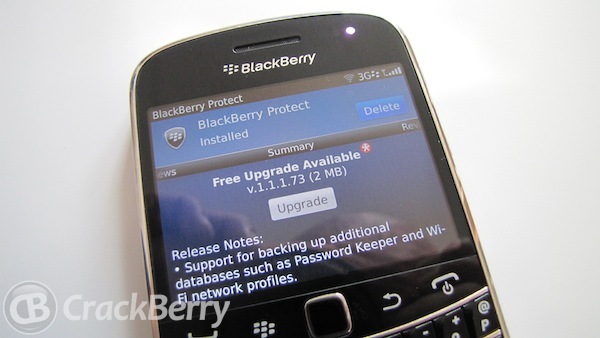 BlackBerry Protect version 1.1.1.73 is now available to download from App World. If you currently do not use BlackBerry Protect I strongly recommend you do. As well as it backing up your contacts, sms, calendar, tasks and memos, the application can also come in very handy if you lose your beloved BlackBerry. Using BlackBerry Protect on the web will allow you to locate your BlackBerry if it is lost or stolen. As well as tracking it on a map, you can sound an alarm on your device, send a message to it and even erase all of its data. If you fancy seeing it in action check out the recent video we posted.